Back from the drawing board, Samsung has re-introduced their latest and greatest phablet. The Samsung Galaxy Note 8 is big and fast with a great display. Today, we look at car and motorcycle mounts for the Samsung Galaxy Note 8 smartphone. The Samsung Galaxy Note 8 is a giant phone. The 6.4 inch diagonally measured display is about the largest available. The dimensions are a bit interesting. It’s not much wider than phones with a smaller display but is taller than most. The Motorola Samsung Galaxy Note 8 measures in at 6.40 x 2.94 x 0.34 inches (162.5 x 74.8 x 8.6 mm) and weighs 6.88 ounces. These are the measurements needed when selecting your mount. Older mounts may not fit the Samsung Galaxy Note 8. The height is dramatically larger than most and needs to be accounted for. While not as wide as you would expect, adding a case to the phone can exceed the dimensions of many expandable cradles. If you find your current holder does not fit, many universal mount manufacturers offer options to upgrade the cradle to a larger one. Be sure to add the size of a case to these stock measurements as you might be approaching 3.5 inches in width. Speaking of cases, buy a good case for it. I have always liked the Otterbox Defender series which we reviewed here, but there are lots of others. Get a case. A single drop on ceramic tile that results in a broken display will cost many times more than the case. If you think insurance will cover it, think twice. Insurance policies purchased from your carrier have a deductible and for newer more expensive phones that can be $169 on up. So to add insult to injury, you will not only be paying the monthly insurance premium, but you will then pay the deductible. You can read our article on phone insurance here. Let’s discuss some mounts. We’re going to stick with mounts that include expandable cradles that will be large enough to hold the Samsung Galaxy Note 8 with or without a case or skin. This means we will go with holders that open wide enough to fit this phone, and add some more space for a well made case. The Samsung Galaxy Note 8 has a huge display which works perfectly on GPS apps like Waze. This is a big phone so you need a big cradle. Consider the Arkon Ultra Slim Grip Suction Mount for the windshield. This mount includes an expandable cradle that expands to almost 7 inches. Your phone will be held from the top and bottom. This will fit your phone with or without a case. The mount comes with an adhesive dash plate so that you can attach to the mount to your dash as well as your windshield. Use the dash disk in states that do not permit windshield mounts which we documented in a recent article. The phone can rotate 360 degrees into portrait or landscape using this mount. Another favorite is the iKross Cup Holder Mount for Tablets and Phones. These mounts serve a dual purpose in that a cradle for a phone and a tablet are included. The mount is adjustable and solidly made to easily handle the weight of your tablet so this phone is a piece of cake. You will see a lot of mounts on the market for tablets or cell phones. This is the only car mount kit that we know of to offer two different cradles, one for the phone, the other for the tablet. One of our favorite car mount locations is the vent in the middle. The air vent is typically a good choice because it’s near eye level and away from where thieves can see it. 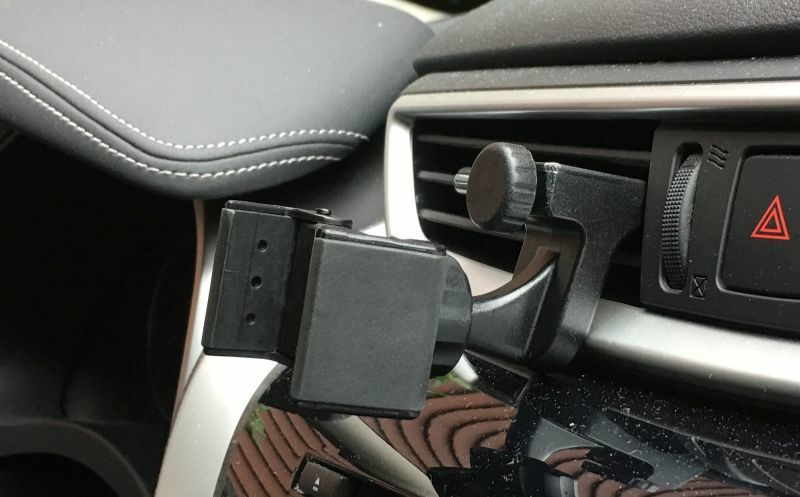 The photo accompanying this article is the Square Jellyfish Jelly-Grip Car Air Vent Mount. The Square Jellyfish Jelly-Grip mount opens to 3 5/8 inches and can be used to hold your device with or without a case or skin. It has a ball and socket so the cradle swivels into any orientation. This mount will work on flat vent slats that are 3/8 to 1 inch deep..
Moving on to the motorcycle, consider the RAM Handlebar Mount with Universal X-Grip IV Holder. This is one of the few mounts to carry a manufacturer lifetime warranty. We wrote about X-Grips extensively on this site and you can view that article here. The expandable cradle opens to accommodate phones ranging up to 4.5 inches wide which means it will fit the Samsung Galaxy Note 8 with or without a case. The included u-bolt mounts to handlebars up to 1.25 inches which is a standard diameter for most motorcycles. We only touched on the surface of mounts available for the Samsung Galaxy Note 8. Be sure to select one that’s well made and will expand sufficiently and then close tightly to hold your extra tall phone.